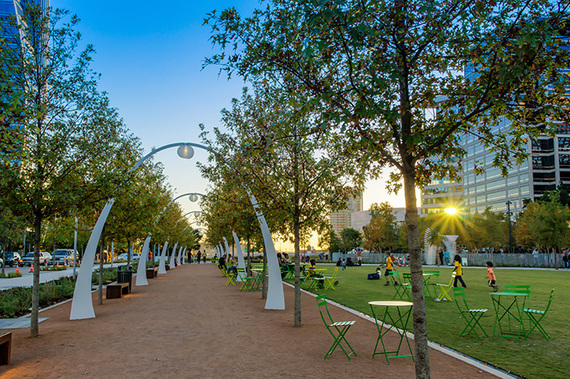 Free Yoga class at CityLine Plaza in Richardson or Klyde Warren Park in Dallas. Yoga is a great way to practice mindfulness, get your muscles stretching, and connect with yourself. Head over to one of these locations on Saturdays (some offer free yoga on Wednesdays and Sundays as well) and enjoy time to reconnect with yourself (or take a friend!). Walk the Dallas Farmer's Market. Wake up and smell the...fresh watermelon? Check out the farmer's market to spice up the routine process of grocery shopping. Let yourself indulge in some local cuisine of the earth or some fresh flowers for your own pleasure. Soak in the scents and the relaxing scenery right here in the heart of our big city (plus, who can argue with free samples?). Check out the Meadow's Museum of Art. Located on the SMU campus, the Meadow's museum displays gorgeous Spanish art pieces. Enjoy walking through a history of art, while also taking advantage of some free classes they offer. Membership is super affordable, or you can visit the museum for free on Thursdays after 5pm. On that note, check out the Dallas Museum of Art. It's true, walking a museum can be one of the most insightful, relaxing, and mindful activities one can do. It's one thing to go with a friend or partner, but if you've got a few hours to yourself and would rather not Netflix and chill, walking the quiet halls of a museum could be a great way to get reflective and thoughtful as you interpret the art before you. Daily admission is free (with exception to some of the advanced galleries). Note that weekend hours may be busier during summertime. There's nothing quite as meditative as day-dreaming out the window of an antique, fully-restored street car. The M-Line Trolley is a relaxing ride option for sight-seeing. And don't worry, the trolley is air-conditioned for your comfort in the Texas heat. So take your headphones and your favorite tunes, and enjoy a nice ride! Check out the famous Katy Trail. If you're into biking, running, or walking with (or without) a pup in hand, the Katy Trail is for you. Mindful of the heat this time of year, I recommend an early day or evening trip on this appealing trail that winds throughout some of Dallas' nice communities. Check out the OTHER amazing trails Dallas has to offer. With locations throughout Dallas, walking, riding, or running trails is such a great way to get outside and enjoy some fresh air. Check out this list of options you've got. No excuse not to get out there for a bit! Check out a coffee shop that is NOT Starbucks. Grab your laptop or a book you've been meaning to get into and check out The Wild Detectives coffee shop and library in the Bishop Arts District. This quirky and unique place offers a cozy spot for you to curl up for a few hours and indulge in some self-care. If you're in the mood for more of a music vibe as you relax and read, check out Mokah Coffee shop, a non-profit located in Deep Ellum. Have you visited any other unique coffee shop spots in Dallas? List them in the comments section below and share the knowledge. There are lots out there! Check out this hidden gem that will make your feet squeal with joy. (Disclaimer: NOT free, but a decent deal). Hidden in the middle of Richardson's neighborhoods is a highly acclaimed foot massage location. Self-care often comes in the form of indulging in your physical healthy and well-being. Try out a ~$30 foot massage at Joy Foot Massage and see what you think. Yes, this is a form of self-care. Set a few hours aside and choose a room in your home to clear out top to bottom. Get rid of any stuff you don't need anymore, donate things you don't need/use, invest in a few organizational bins, and straighten up. It's amazing how great you will feel afterward. Start with one room and take on a different one next week. In a month your home life can be feeling so much more zen! Take a mindfulness meditation class. Mindfulness has become a prominent part of the mental health and emotional wellness movement. The Dallas Meditation Center offers different classes at different locations throughout Dallas. They also offer a meditation class for millennials in their 20s and 30s! (Read more on website to see how they run their classes based on themes of Buddhism and historical mindfulness concepts). Or, practice mindfulness meditation at home with Headspace. One of the leading apps on mindfulness, Headspace is super accessible if you've got a phone. Created by Andy Puddicombe has started a movement that is changing the way we treat our minds through this versatile app. Check out a free 10 day mindfulness series! Hit up a few of these newly renovated dog parks. Don't want to leave the house without your furry friend(s)? Check out these hot spots where all pups are welcome. Enjoy the art & wine walk in the heart of Plano. Okay, okay - some self-care activities can involve other people. Grab a friend you love spending time with and go enjoy sampling some wines while exploring art exhibitions to some live music. Free on the second Thursdays of each month. Dive into your imagination: visit a Dallas library. I know, I know. Libraries are SO last decade. But truly, getting yourself out of the house and off of the technology for a while can allow you to get in touch with yourself in more creative ways. So go classic and take a few hours finding some books you've been wanting to read, search for an old classic, or research some topics that are interesting to you. Don't worry, there's wifi if you need a social media break. Hopefully this list has your brain juices flowing and you've got some ideas up your sleeve for some great self-care activities. Remember: self-care is not selfish. You are worth taking a few hours to yourself to fill up your tank. Have a wonderful summer!